This interview is the first of a series called « Cinecology », dedicated to the various kinds of links between cinema and ecology (the other two, unfortunately available only in French, are with Jean-Baptiste Fressoz and Hervé Aubron), and whose general goal is to think over the ways films can help us to decipher ecological phenomena and to invent new ways to perceive our relationship to environment. This one focuses on a set of movies made after the Fukushima catastrophe (the earthquake and the tsunami that followed) and adressing its stakes in different fashions, from the meditation upon the fascination for disaster images to the piety of interviews collecting testimonies about the lives of the abandoned inhabitants of the so-called « Zone ». Despite their strong differences, they are all linked to a national tradition regarding nuclear power, and they all reflect the ability of cinema to digest and translate events that often are beyond our intellectual grasp. These are the points Elise Domenach is here unfolding. A teacher in Film Studies in the Ecole Normale Supérieure de Lyon and a film critic for the French magazine Positif, she was until recently a Visiting Professor at the Meiji University (Tokyo), where she conducted researches about the echoes of the Fukushima catastrophe in films, mainly Japonese but not only. We deeply thank her for her kindness in receiving us. Débordements : You have reviewed many films on Fukushima disaster. Who are the directors of these films ? Are they young filmmakers ? Filmmakers with an activist past ? Established filmmakers ? Elise Domenach : It depends, first of all, on what we mean by “Fukushima Films”. The event had repercussions at many different levels. We owe to documentary filmmakers the first films (good ones and not so good ones) made after the triple disaster of March 11th 2011, which is called, in France the catastrophe ‘of Fukushima’ - the earthquake, the tsunami and the nuclear accident. To start with, one has to be aware that Fukushima is the name of the conurbation in which the damaged nuclear reactor is situated. The whole area was not affected to the same degree - for instance, the coast, Hamadōri, was much more affected than the inland region of Nakadōri. And, of course, the disaster was in no way limited to this conurbation : the earthquake and the tsunami were also very violent in regions situated further north (Miyagi, the coast of Sanriku and Miyako). The radioactive particles that came out of the damaged nuclear plant also reached regions further south (Tomioka, Tsukuba, Chiba...) following winds and rains and affected them even more, sometimes, than other regions which were closer to the damaged reactor but protected by the surrounding mountains. We must, therefore, be careful not to assign the disaster too quickly to a single area. Englishspeakers call it 3/11 which immediately draws a parallel between the nuclear disaster and the experience of a terrorist attack, which is of a completely different nature. But the advantage of this label is that it takes into account the event’s dimension as a “national experience” for the Japanese. 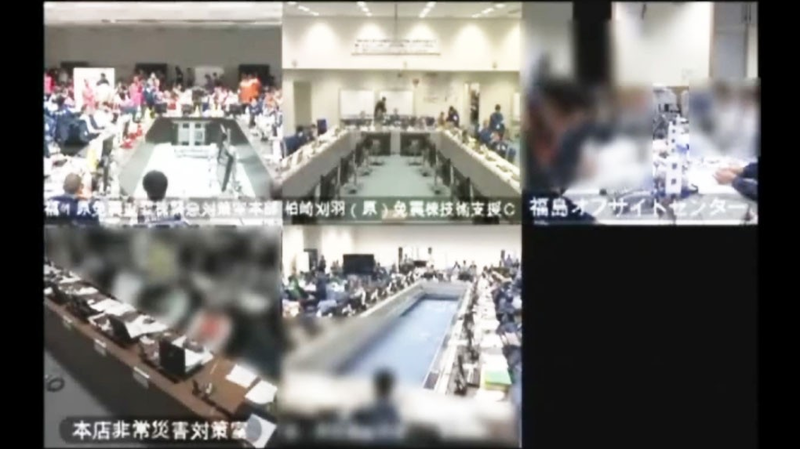 The disaster of March 11th 2011 was initially filmed by reporters sent by television channels (local television networks and the Fukushima network were the first on the spot, but there were also, of course, national networks) and by documentary filmmakers. Some documentary filmmakers went to the site to film as a reaction against the images being broadcast by the television channels, which they judged questionable in terms of ethics, devoid of any historical or political perspective and too emotional. Additionally the press was unable to go beyond a fixed ‘secured’ perimeter, some distance from the nuclear plant. A few documentary filmmakers, who could move more freely and had more ingenious methods managed to penetrate into the zone or investigate areas of radioactive contamination. Among these were young filmmakers : Fujiwara Toshi (director of No Man’s Zone), Matsubayashi Yōju (director of Fukushima : Memories of a Lost Landscape) as well as established filmmakers (such as Mori Tatsuya, the director of two films on the Aum sect : A (1998) and A2 (2001) and who co-directed 311 with Watai Takeharu, Matsubayashi Yōju and Yasuoka Takaharu, or again like Omiya Kōichi, the director of the The Sketch of Mujo). For some people, the disaster marked their transition into (or their return to) documentary filmmaking. This was the case with Sakai Kō and Hamaguchi Ryūsuke, the two directors of a trilogy on the tsunami in Tōhoku (The Sound of the Waves, Voices from the Waves, Storytellers), with Fujiwara Toshi (No Man’s Zone) and, with Funahashi Atsushi whose Nuclear Nation was the first documentary on the catastrophe of March 11th to tour film festivals around the world, following its premiere in Berlin in 2012. They had made fiction films before and were led to the documentary format by the extravagant dimension of the disaster, trying to make sense of what had happened through the medium of cinema. Many filmmakers felt what Kurosawa Kiyoshi expressed in his interviews with the press, that it was too early to start building fictions. Even while always maintaining that : “We must, indeed, carry out an enquiry into our responsibility for Fukushima, especially through cinema.” We also witnessed the interesting phenomenon of filmmakers such as Matsubayashi Yōju and Sōda Kazuhiro who lived or worked abroad and came back to their country. Other filmmakers saw their long, established careers completely reoriented by this event, as Kobayashi Masahiro who comes from a small city (Kesennuma) that was literally wiped off the map by the tsunami, and shot a minimalist fiction (Women on the edge) in this location immediately after the disaster and, some time later, a second film, Japan’s Tragedy. Sion Sono, who had decided he would stop making films, went back behind the camera to direct two fictional pieces on the disaster : Himizu (based on a manga by Furuya Minoru) and The Land of Hope which was released in theatres in France. Shinozaki Makoto had already had a long and rich career since Okaeri (1995), the film that made him famous in France, during the period when he was the editor of Cahiers du Cinéma Japan and close to Kurosawa Kiyoshi. The disaster led him to direct two consecutive fictional works on the nuclear accident and its repercussions on the collective psychology of the Japanese : Since Then and Sharing. These two films were markedly more political and committed than his preceding opus. In spite of the diversity of cases, two things can be observed. First of all, a certain pre-eminence of the documentary as opposed to other genres. Fiction, animated films and experimental films only came afterward. But the production of documentary films did not slow down either. The reason for this being perhaps that the crisis itself was still ongoing and the situation in the area in and around the nuclear plant had not come under control. And then again, we must admit that while some great documentaries on the event have been made, we are still awaiting “the great fiction”. It is too soon, perhaps. Kurosawa Kiyoshi said that ten years of digestion and gestation were needed for such a film to be possible (in the theatre Shibuya Image Forum, during a Q&A session with directors Sakai and Hamaguchi, in November 2013). Maybe he is right... Especially since March 11th 2011 is not so much the name of a catastrophe as rather the beginning of a new era. In this sense, the “Fukushima Film” corpus remains essentially open. D. : Are there any recurring themes or persistent dramatic configurations in these fictional works ? E. D. : I would say there are two : the family and madness. With regard to madness, the tendency is to conceptualise the disaster not as the cause but, rather, as the revelatory agent of a process that was at work before it happened. As if the disaster brought to light a kind of collective psychosis that had remained veiled. There is a revival of interest in a set of pathologies branded “Nipponese”. For example, the voluntary disappearances seen in Imamura Shōhei’s A Man Vanishes (1967). Many people vanished after March 11th, or shut themselves away into deadly isolation following the loss of their loved ones. Among the numerous psychological problems brought about by mourning or the fear of radiation are paranoia, schizophrenia and forms of hallucination : some people believing they are being pursued by ghosts, caught by those who died in the tsunami. Several films deal with the link between the two devastating events, psychological devastation and environmental devastation, the second operating as a symptom of the first. For example in the case of Odayaka by Uchida Nobuteru, which revolves around two women neighbours living in a Tokyo suburb, who are driven almost insane by the nuclear disaster. Both of them worry about radioactivity and rebel against the common tendency of behaving as if the situation were under control. The Korean actress Sugino Kiki who co-produced the film has given a sensitive portrayal of the role of the young mother accused by other parents in her daughter’s school of betraying the Japanese values of perseverance and dignity and of spreading hysteria. The young fiction filmmaker Uchida Nobuteru (Love Addiction, 2010) explains his intentions in the press-release on the film ; intentions which are clear and courageous : “If we, the Japanese, choose to shut our eyes to the fear and anxiety that we felt after the earthquake and because of the current situation in Fukushima, we will not be able to move forward and go beyond it. We cannot ignore the events of March 11th 2011.” The film is unfortunately rather clumsy. The question of the effect the disaster has had on Japanese psychology is at the heart of Shinozaki Makoto’s two works of fiction. Since then explores the question with the case of a couple and Sharing looks at it in the context of a university where a professor of psychology investigates the phenomenon of disaster premonitions. While on this theme, we must also mention Kurosawa Kiyoshi’s recent films, Shokuzai, which deals with the unfolding of a childhood trauma in the lives of four women. Having witnessed an aggression, the women attempt to deal with their experience through both transference and denial. Real follows on this exploration of the border between the real and the imaginary, the conscious and the unconscious, and of intimate disasters. For Kurosawa Kiyoshi this approach deals not so much with the representation of disaster itself as with the examination, through our lives, of how it actually occurred due to a certain Japanese mindset.” As a matter of fact, Real also deals with these ravaged psyches that the disaster brought to light. This rather distressing subject is also the theme of a Japanese blockbuster that was a great popular success at the Tokyo International Film Festival, Parasyte by Yamazaki Takashi, a manga adaptation. The film centres on the event of contamination that is supposed to punish men for sullying nature. As such, the disaster takes new forms and undergoes several metamorphoses. The disaster thus put into a narrative form, animated through images opens up and leads to multiple meanings. In light of these latter examples, one might even say that there have been nearly as many indirect representations of the disaster as there have been psychological-horror movies in Japan since 2011. Family as such is a theme that is far more complex. It is the central theme of all dramas based on March 11th because the relation to the nuclear in Japan varies with each generation. For the young people, civil nuclear power is the only nuclear power. They have grown up in a nuclear and pacific Japan, an imaginary impression shaped by Eisenhower’s “Atoms for Peace” campaign and carried away with an excessive confidence in the safety of the equipment. It is among the older generation that you find the bulk of the anti-nuclear activist contingent (see Oguma’ssociology film, Tell the Prime Minister, about the Japanese anti-nuclear protests since 2011), especially amongst the sexagenarians who, in the sixties and seventies, organised protests in the wake of major environmental disasters and who are closest to the memory of the atomic bombs of 1945. Such as the documentary filmmaker Kamanaka Hitomi (the director of a trilogy on nuclear bomb and radiation : Hibakusha (2003), The Rokkashomura Rhapsody (2006) and Ashes to Honey (2010)) and Kuraoka Akiko who directed Live in Tokyochrome (1978) with Yamamura Nobuki, a film on chrome pollution caused by the chemical industry in two districts in Tokyo in the early 1970s, as well as The People of Rokkasho (1985) and Summer Homework Left Undone : Living Next Door to Nuclear Reprocessing Facility (1989) on the resistance of the Aomori residents to the construction of an industrial complex for reprocessing nuclear waste. Both directors inherited the legacy of Tsuchimoto Noriaki and his famous trilogy on mercury pollution in Minamata (The Victims and their World, 1971-1975). However, many young parents, worried about radiation, have joined the ranks of the ecological and anti-nuclear activists since 2011. 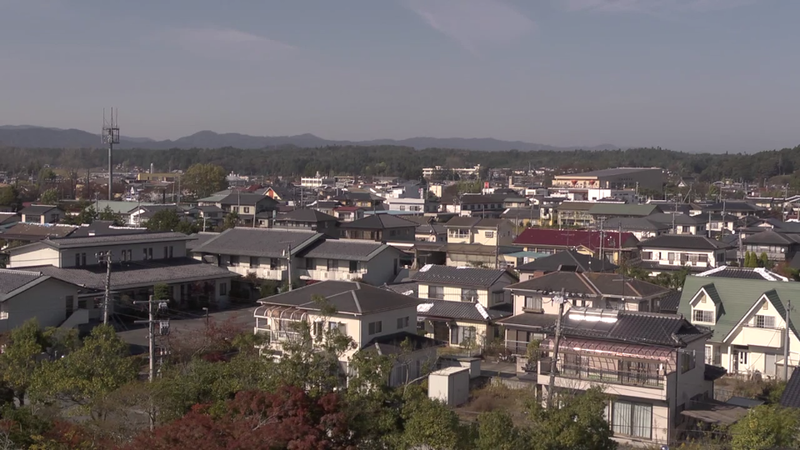 This is seen in Lullaby under a Nuclear Sky, in which the documentary filmmaker Kana Tomoko, who was working on a film at Fukushima when the disaster occurred, discovers, being herself forty year old that she is pregnant. She decided to stand in front of the camera and film her own worries and questions. Many films focus on the differences between the reactions of different generations. This is the subject of The Land of Hope by Sion Sono, as well as the two films by Kobayashi Masahiro, Japan’s Tragedy (on a father and son who have lost everything and find themselves all alone with each other) and Women on the Edge (on three sisters who are reunited in their parents’ house in Kesennuma, which has been devastated). In this regard, the films on Fukushima resemble those made in the 50s on Hiroshima and Nagasaki such as Kurosawa Akira’s I Live in Fear. The disaster is, thus, felt first and foremost at the level of the familyunit that ends up exploding as a consequence. Sono Sion’s film might be titled The Land of Hope but the region itself or the country it depicts appears derealised. The film is dystopian and ‘The Family of Despair’ would be a far more fitting title. D. : So there is no trace of the activist tradition represented by people like Wakamatsu or Adachi ? E. D. : There are many films that are openly anti-nuclear and activist films, but they belong to a tiny minority and are produced mainly by the older generations. And the best works are not found among these kinds of films. It is also essential to rethink what the idea of activism means in this case. All these filmmakers set out with an intention that is born out of activism. They intend to shake up Japanese society, that has fallen prey to the illusion of being able to guarantee the safe production of nuclear power. They are angry but lack any sense of protest. Given the enormous value placed on the community, many avoid breaking apart what constitutes the backbone of society. Disagreement, then, can only rarely take the form of a public gesture, even if there have been giant demonstrations organised around certain nuclear plants. D. : Are there any aesthetic constants in this collection such as the use of ‘voice-overs’, an essayistic penchant, a love for interviews, a certain type of image...in short, any formal recurrences ? E. D. : The tendency is more towards heterogeneity. Even the interviews take very different forms in practice. Let us consider four films, Nuclear Nation, Fukushima : Memories of a Lost Landscape, No Man’s Zone and the rather bad 311. This last film was made immediately after the disaster (two weeks, to be precise !) It was screened at the Yamagata International Documentary Film Festival the same year, in October 2011. 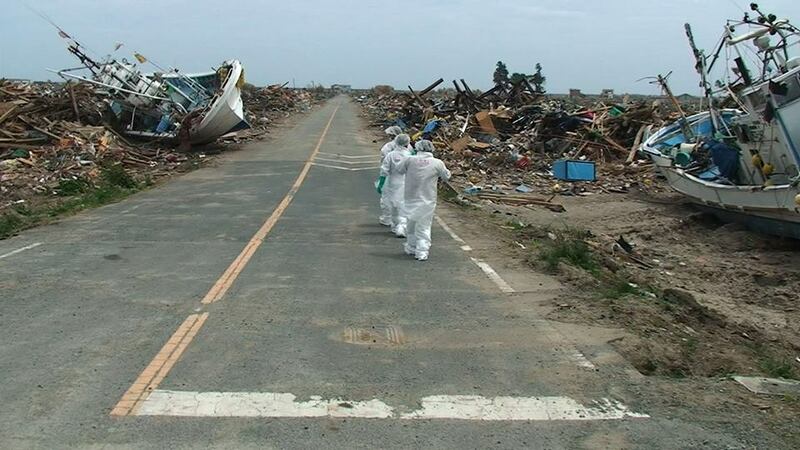 Mori Tatsuya, the seasoned documentary filmmaker, flew off in a truck with a team of three filmmakers to collect images of the disaster, with the principal aim of documenting the event, and without thinking of immediately making a film. As they travelled towards the damaged plant, the filmmakers realized the magnitude of the danger. Their dosimeter went crazy. They filmed landscapes that were completely devastated and met survivors who were searching for the bodies of their loved ones. This led them to this scene which created a real scandal in Yamagata : they approach a site where corpses are lined up to be identified by families, and sticks are thrown at the filmmakers’ faces. The interview, thus, sometimes radically fails. Conversely, Matsubayashi Yōju, who was part of the 311 team and who seemed very uneasy during the shooting, shot a film of very personal interviews, Fukushima : Memories of a Lost Landscape, opting for the oppposed approach that is to say not to observe the victims from the outside in moments of great distress, but to turn the camera into an interlocutor that participates in the victims’ battle for survival. The film opens with a personal reflection, in the first person, on the decision to travel with a camera to aid the victims as best as possible, driven by a feeling of co-responsibility for the disaster, as a Tokyoite and consumer of the electricity produced at Fukushima. The film follows his close dialogue with the Tanaka family, refugees in Minamisōma, sharing their everyday life in an emergency shelter. Funahashi Atsushi directed Nuclear Nation and Nuclear Nation 2 several months after the event, interviewing the same person over a period of almost two years, not on the site of the disaster but in a high school turned into a refugee centre in the Saitama prefecture. He has been greatly inspired by Wiseman in painting a closed institutional space out of which the film prevents us from moving. He has a very emotional way of conducting the interviews, bringing out his own empathy as much as the words of the other person, but without emotionnal upheaval and taking care not to overlook what the person has to say. It is more a form of “participant observation”, like Soda Kazuhiro’s method. Fujiwara Toshi’s No Man’s Zone could represent the last approach. His interviews with the people living around the damaged plant are very analytical. They claim to be informal (I bring you saké, you tell me how you feel alone etc.) but bring to the fore a very intellectual relationship to the disaster - undoubtedly necessary as well. His interviews with the oldest people allow us, for instance, to reconstruct the context in which the reactors and the Fukushima power plant were built : how the local economy prospered thanks to nuclear power. Rather than welcoming reality and the experience of his interlocutors, the filmmaker deconstructs them from his position as an author. In between two interviews, Fujiwara perfectly constructs a wide shot of the ravaged landscape and plays jazz music over these images, or makes use of a very clearly articulated voice-over which brings the disaster in line with our fascination for destruction, with Japan’s colonial past. All of it is actually quite overwhelming. The most in-depth reflection on the question of interviewing the “victims” is found undoubtedly in Sakai Kō and Hamaguchi Ryusuke’s trilogy shot in Tōhoku (The Sound of the Waves, Voices from The Waves, Storytellers) the unity of which arises from the use of the same setting in all the films with two people face to face. Describing, recalling and listening become one and the same act, both empathetic and memorial. D. : Fukushima and nuclear power in general are caught up in a dialectic opposition between the invisible and the ultra-visible. On the one hand, we have a right to images like those of the bomb or the tsunami, mass images that are radical and make the apocalypse tangible, operating in proportions that belong to the most seasoned action films. And in contrast to this, there is the invisible force, radiation, which the naked eye cannot detect. This brings back into play and displaces the old question of the incomprehensible at the heart of each disaster. Are there films that bring this visual antinomy into play and try to approach it through a formal work ? E. D. : I know of only one film that really reflects on this problem, Fovea centralis by Philippe Rouy, the third film that he dedicated to Fukushima. The first, Four Buildings Facing the Sea, showed images of the Fukushima Daiichi power plant recorded by surveillance cameras and available online on the TEPCO site. The second, Machine to Machine, used images collected by robots that were sent inside the damaged reactors. This was a work on the non-human perception of the disaster which, in a way, takes up Godard’s question on the link between cinema and the camps, on historical sites which cinema could not / did not / failed to visit, on the unknowable and the lack of images. But the problem has now changed : evil is materially possible and no longer morally unthinkable. Fovea centralis thus follows another path. It blends at least three things at three different levels : texts by scientists and a reflection on the effect of radiation on the human eye (loss of colour, progressive blindness) ; the use of images from the TEPCO videoconference in the midst of the crisis (in the month following the accident at Fukushima) ; a meta-reflection on the cinematographic medium, on the light that simultaneously reveals and hides, and on the retina hit by radiation. It is, thus, a profound film on nuclear power that blinds, both in the physical sense as well as in the psychological and political sense ; on the way radioactivity’s invisibility completely impairs our ability to see and throws into denial and refusal to see (sceptic impulses, as old as time) in a larger sense. This point brings up some classic problems : the inversion of the visible order in landscapes of destruction, the damage done to landscapes. This is precisely what No Man’s Zone is about and it is, from this point of view, firmly anchored in the Tarkovskian tradition of viewing devastation according to the aesthetic canon of the sublime. The film questions our fascination for images of destruction in a way that, as far as I know, no other film does ; the beauty of these ravaged landscapes and the stunning effect that they produce. How can we understand the reason why our ability to take collective action is hindered to such an extent, if we do not look for explanations in the deepest impulses that guide us such as the sceptical temptation ? D . : I shall take advantage of the fact that you are also a philosopher to ask you a question that is more abstract and broader : these responses to the ecological events are also determined, in part, by the cultural context, a relationship with nature that is both theoretical and sensitive. And this relationship is, I assume, different in Japan where it is not anchored in the same way in Cartesian philosophy or Naturphilosophie ? Can we link all these films to some uniquely Japanese sensitivity to Nature ? E. D. : There is a certain doxa - orientalist, as a matterof fact - that holds that the Japanese are supposedly more respectful of Nature, more sensitive to its richness and closer to its harmony etc. This fantasy of an ecological Japan is fed, it must be said, by some rare and wonderful experiences such as the rehabilitation of the industrial island of Naoshima (in the inland sea), the ancient site of the Mitsubishi refinery converted and revitalised by contemporary art that saw an amazing cooperation between the superb architect Tadao Andō and the Benesse Corporation (the giant publishing house). But this is, on the whole, a misleading image. The terrible mercury pollution at Minamata, for example, that came to light in 1959 (and which had gone on since 1949) in no way influenced environmental policies. And when we see the wastefulness, the volume of refuse, neon-lights everywhere in Japon, the number of nuclear reactors on Japanese soil (54 functioning, before March 11th 2011), we begin to harbour doubts about this picture-postcard view of a country that is supposedly so very respectful of Nature. Nonetheless, there is a clear difference in the representations of Nature. Destruction is not seen as non-natural. Disasters are not seen, as they are in our country, as the sign of departure from the peaceful homeostasis we often identify natural order with. To us, because, in the words of Descartes, man must make himself “master and possessor of Nature”, if Nature misbehaves, goes over the edge and takes on excessive dimensions, there is a protest, a revolt. It is unthinkable to see Nature as so explosive, disproportionate. In Japan, destruction is accepted at the outset as being part of the “natural” order of things. This is clearly seen in Sakai and Hamaguchi’s trilogy : The Sound of the Waves, The Voices of the Waves and Storytellers. The three films, in a way, pay tribute to the forces of Nature, be they destructive or creative. And the residents of the Tohoku region, where almost each generation witnesses a giant tsunami, know this better than anyone else. It is very often said that the Japanese demonstrate a sort of resigned acceptance of disasters, without thinking about the racism involved in attributing such a degree of passivity to a national population, trapping them in an oriental languor, a love of fatalism. It would be better to say that it seems to them absurd to get angry over a natural phenomenon. And that they express anger in accordance with codes that we, for the most part, do not understand. This gives rise to many misunderstandings and shifts in meaning that sometimes come close to beeing odious, on part of visitors from the West. In Japan, destruction is conceptualised as being at the heart of the order of things (Tokyo, built and rebuilt after successive fires and bombings ; Kobe, reborn after the 1995 earthquake, Hiroshima, rebuilt from scratch). The corollary to all this is the dangerous idea that a disaster has no real cultural dimension, no human cause. In short, the artificial, industrial and political dimension of the disaster may to be completely hidden. D . : While Fukushima was the catalyst for reflections on these subjects, it must still be noted that they were already being discussed, even if only by a minority, in films produced before the disaster. If we had to sketch the rough contours of the presence of a debate on nuclear power in film, from the end of Welles’ Trial (1962) to Kurosawa’s Dreams (1990), what do we have ? E. D. :This is an important question but, to be honest, it isn’t one I asked. On this subject we must mention Hibakusha Cinema : Hiroshima, Nagasaki and the Nuclear Image in Japanese Film, edited by Mick Broderick (New York/Londres, Paul Kegan, 1996), Atomic Light (Shadow Optics) (Minneapolis, University of Minnesota Press, 2005) by Akira Mizuta Lippit, and the work of Abé Markus Nornes on the representation of nuclear power in Japanese documentaries since 1945 in Japanese Documentary Film : from Meiji Era through Hiroshima, (Minneapolis, University of Minnesota Press, 2003) and in several papers. What interested me was to reflect (along Stanley Cavell’s lines and with his tools) about scepticism in cinema. I asked myself, above all, how these films on nuclear power, across all the directorial issues we just spoke about, make us reflect upon man’s relationship with the world, with others and himself, as brought about by doubt and a sense of inadequacy, both being modified and remodelled by the nuclear crisis that began with the disaster of March 11th 2011. This is the central question of my research : what relationship with the world does this event bring about ? And how has the human community been threatened and reshuffled by this experience, whether it be at local, national, international or ‘planetary level’. I like this word, ‘experience’. Luc Dardenne puts it beautifully in Au dos de nos images (Paris, Seuil, 2005) when he says that works of art give us back human experience in situations where it is missing. In the end, we lack experience more than we lack concepts. This is why these films are so precious tools to foster our thinking. The most beautiful works recreate human experience where there is nothing but destruction, terror and dread, when the disaster did its work, depriving us of the means to grasp it, to comprehend it. The nuclear crisis thus reconfigures our scepticism : it brings into play this fundamental experience which Cavell describes (after Hume, Kant and Wittgenstein) as a “feature of human nature”, our difficulty in projecting ourselves into a relationship of faith, closeness and understanding with the external world, others and ourselves. Nuclear power is more the expression of a misconnection, a desire to be done with the world. It is the opposite of a need for proximity, for presence and a passion for the existence of the world as if it were an other being. “If you cannot avoid tragedy, avoid love ; if you cannot avoid love, avoid integrity ; if you cannot avoid integrity, avoid the world ; if you cannot avoid the world, destroy it”, Cavell says in the beautiful essay about King Lear in Must We Mean What We Say ?. My hypothesis is that the nuclear crisis is likely to be a contemporary manifestation of our scepticism. This is both ancient and novel. Every age has seen scepticism in a unique way. Cavell dedicates some long explanations in The Claim of Reason to this paradox, which claims that scepticism is both historical and eternal or ‘transcendental’ - Kant has already made of scepticism a building block of human reason. Nonetheless, sceptical temptation has taken historically variable forms. I have worked, for example, on the freedom of expression in Polish films between 1980 and 1989 (during the period of “democratisation” between the massive Gdansk strikes and the first free elections in Poland, especially in the work of Wajda, Lozinski, Kieślowski etc.) The scepticism problematic can, in this context, be formulated as : how do you find your voice in your own story ? What is this democratic, political speech that we claim in the name of others and in our own name ? And the Polish films which bring forward these hesitant, fumbling voices, use a million different ways to put the microphone at the heart of the directing scheme ; this was their way of using cinema in order to establish a relationship to the world that would be devoid of political lies and propaganda, of the habit of saying without meaning what is said – and thus of a form of nonsense (which brings us back to Cavell’s philosophy of ordinary language). The nuclear crisis also allows us to highlight this singular aspect of scepticism : nihilism. There are several films that tend to show the use of atom as a force of annihilation rather than a form of doubt. Cavell explains that we are trapped between two simultaneous temptations, two voices : the metaphysical voice and the voice of scepticism. And the destructive impulse is nothing but an extreme form of doubt. D. : In an article that appeared in Positif (« Fukushima en cinéma : comment survivre à notre folie ? », no. 631, September 2013) you speak of the fascination with which some of the films that you review are shot The disaster did not bring about only rejection, it also revealed some of the ambivalences in our reaction for these sumptuous images of devastation, as if destruction was not without a certain eroticism. This is something that Cavell is emphatic about : there is a mirroring effect between external devastation, natural, social, political disasters, and a feeling of internal devastation. It is because we are familiar with these internal ravages, with the feeling of exile vis-a-vis the self that they engender, that we are so receptive, even from afar, to images of destruction wrought by tsunamis, earthquakes, ecological or nuclear disasters. In his autobiography Little Did I Know (p.18sq. ), Cavell recounts the memory of a violent argument between his parents which left him, as a child, with a feeling of destruction, annihilation. And this annihilation of self would come up again later in his life whenever he witnessed or was a victim of devastation. There is evidently a psychoanalytic dimension to this, but it is not the only dimension. The manner in which a disaster is experienced reflects an other, recalls an other ; this link between something which has always been familiar, internal, and an external catastrophic reality, this is crucial in our lives. A disaster echoes a destruction that made us, that is part of us. This link has its origins in the very structures of reason and of human experience. It, thus, draws upon both philosophy and art. Interview made in Paris november the 15th, 2014. Translated from French by Akhila Phadnis and Josiane Scoleri. Images : Nuclear Nation (Atsushi Funahashi, 2012) / No Man’s Zone (Toshi Fujiwara, 2012) and The Sound of the Waves (Ko Sakai and Ryusuke Hamaguchi2011) / Fovea Centralis (Philippe Rouy, 2014) / Four Buildings Facing the Sea (Philippe Rouy, 2012) and The Land of Hope (Sono Sion, 2012) / Nuclear Nation.